Step 1. Preheat oven to 180°C (160°C fan-forced). In a frying pan over medium heat, place the oil, onion and bacon and fry until the onion is translucent and the bacon is browned. Step 2. Add the cream cheese to the pan with sour cream, cream, cheese and chives. Reduce heat to low and whisk together until melted and combined. Remove from heat. Step 3. Cut the top off the cob loaf and remove bread from inside the bowl. Tear bread into small pieces and place on a baking tray covered in baking paper. Spray lightly with canola oil. Add French bread to a second tray and spray lightly with canola oil. Step 4. Pour cheese and bacon mixture into the cob loaf, place top on and bake for 15-20 minutes or until the outside of the cob is warm and crispy along with the bread pieces and extra French bread. 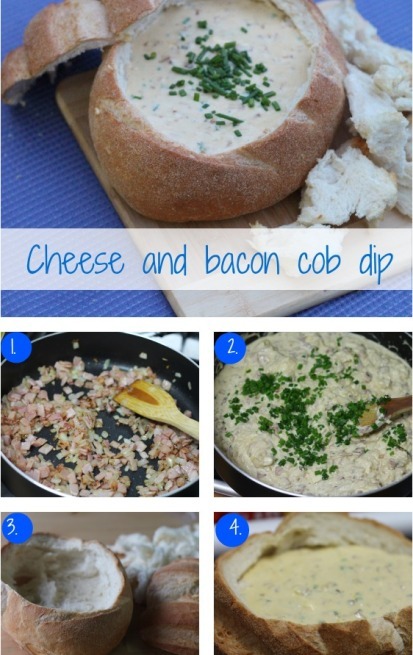 In this recipe you need the extra French stick because there is a LOT of yummy cheese and bacon dip. Don’t be tempted to add more than 200g of bacon in this recipe or it will become very salty. If you like a healthy dip then this Babaganoush (Smokey eggplant dip) is a delicious Middle Eastern recipe that tastes great with flat breads. If you love Italian flavours then Basil pesto dip is a great party platter dip. Another popular cob dip is Spinach cobb dip. It is baked in the same way this cheese and bacon dip is made. If you like hummus then this Tomato and basil hummus dip is a great twist on the original. This Prawn layer dip is a decadent platter that will have them asking for more. We have made it with fresh prawns. If you want a sweet dip then you can make this Healthy raw caramel dip. It is a great sweet after school treat. If you love raw cookie dough the this Cookie dough dip is a sweet treat that the kids will love. When you have a craving for cheesecake this 2 ingredient cheesecake dip with fruit is a fast compromise and little healthier with fruit on the side.